Emceed by H.B. Ward a.k.a. "The Tamer"
I hardly knew what to make of the press put out by The Magpies Project over The Happy Family Series: Demonstrations Exploring “Harmonic Antagonisms” inspired by P. T. Barnum’s museum piece “The Happy Family.” Living by the creed “There’s a sucker born every minute,” Barnum constructed a fallacious exhibit wherein an assortment of animals, both predators and prey, were forced to live in harmony with each other as a spectacle of example to humankind. As such, The Magpie Project’s own assortment of talented misfits, drawn together from the usual fringe theater suspects, could easily be collected under any random title. Maybe the overwhelming wholesomeness of the holiday season has wormed its way into the company’s artistic direction. Never mind. Any excuse to see these performers is good one. Emceeing the madness is H. B. Ward, aka “The Tamer,” who delivers the funniest, most intelligent opening comic monologue I’ve witnessed in years. He’s a man in complete control of the audience—without need of whips and little need of chairs! Most of the rest of the collection, curated by Shawn Reddy, follows in this comic and quirky vein. Whether any of it refers to family hardly matters, but one will find some startling depth along with the laughs. The first weekend run in particular saw a short memoir simply read aloud by writer and critic Brian Nemtusak. It was the sort of thing one might hear on Public Radio’s This American Life, only with greater psychological depth, quiet power, and less desperate need to please the audience. It came closest to all the evening’s exhibits in articulating the antagonisms between three generations of men and what each generation tried to do to compensate for them. Ira Glass, eat your heart out. Stopping by to see The Happy Family Series over the next few weeks will be more than worth your while. Who knows, maybe the oddness of the “exhibits” will strike some familial similarity. Featuring work by: Martha Bayne, Ian Belknap, Dave Buchen, Chris Bower, Eiren Caffall, Mark Chrisler, Robin Cline, Barrie Cole, Elvisbride Band, Idris Goodwin, David Isaacson, David Kodeski, Jenny Magnus, Brian Nemtusak, Beau O’Reilly, David Pavkovic and Vicki Walden (of DOG), The Lawrence Peters Outfit, Diana Slickman, Edward Thomas-Herrera, and David Wilcox. New works suggest a promising future. What a pleasure to be able to review The Alumni Bow, the latest offerings from the School of the Art Institute of Chicago’s MFA Writing Program, particularly since it doesn’t have much in the way of press to promote itself, other than a few hand-distributed flyers and a blogpost by one of its playwrights, Idris Goodwin. Under the direction of Beau O’Reilly of Curious Theatre and Stefan Brün of Prop Thtr, these simple one-acts show surprising maturity and sophistication, even if some could benefit from the editor’s scalpel. The challenge for O’Reilly’s direction will be in how effective that tour will remain should the audience capacity exceed the space for the tour to take place. As it is, it’s just as interesting to view the crowd as the actor—the one that I was in paraded from room to room with an almost funereal solemnity. Berke’s performance is nuanced, a tribute to an actor for whom this is the first full-fledged role; prior performance experience has been mostly as a rock and blues musician. 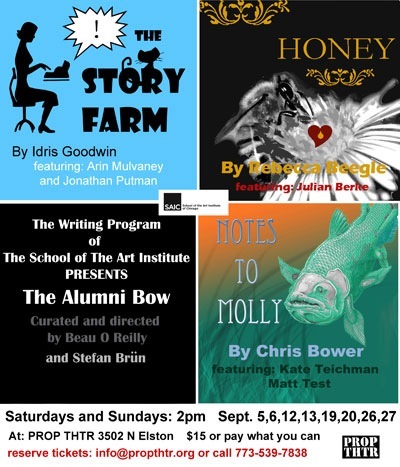 The Story Farm is the most intellectual of all these works, a savvy bit of meta-theater, commenting on all things corporate, politically correct, and metaphorical. Between an earnest jobseeker (Arin Mulvaney) and a story research trainer (Jonathan Putman), Idris Goodwin gets to pull out all his jibes at corporate world’s ability to devalue everything, including the power of stories, to their most rudimentary and meaningless frameworks. From there, it is just a hop, skip, and jump to having the utterly ratiocinating story researcher swept up beyond reason by a story Mulvaney’s jobseeker brings in, while she remains blithely uninvolved by her own discovery. The transformation is enjoyable to watch in Putman’s hands, given the intensity he delivers through his character and Mulvaney’s good-natured, cat-loving foil is realistically vacuous. Goodwin seems to have the most experience of all the young playwrights and, concomitant with his break beat poet background, plays with ideas and themes with greater virtuosity than the others. But of all the other playwrights, Goodwin’s work would most benefit from an editor’s eye in taking off a good 10 to 15 minutes from this play. Notes to Molly by Chris Bower deals the most devastating realism of all these pieces. Based on his short story by the same name, the play etches an indelible portrait of a dead-end alcoholic couple and the psychological forces that barely keep them hanging on, to themselves and to life. It is an intensely realized work, almost perfectly performed by Kate Teichman and Matt Test. All three one-acts deal with some aspect of story, but Bower’s work shows most knowingly how story is used by this couple to evoke a past or present which gives each of them more power or discredits the other, yet does nothing to really disrupt or improve their passive-aggressive relationship. Bower shows great maturity in delineating the symbiotic nature of their mutual dysfunctions and leaves us hanging where they hang, in a subjective no-man’s land, with Test’s character desperately trying to get his fellow alcoholic lover’s attention. Don’t leave these works out in no-man’s land. 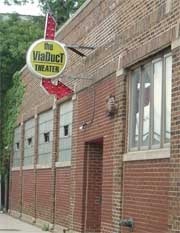 The Alumni Bow has a very short run and Chicago should get to know its next generation of original work.